The UMF Partnership for Civic Advancement was recently honored by the Maine Campus Compact . 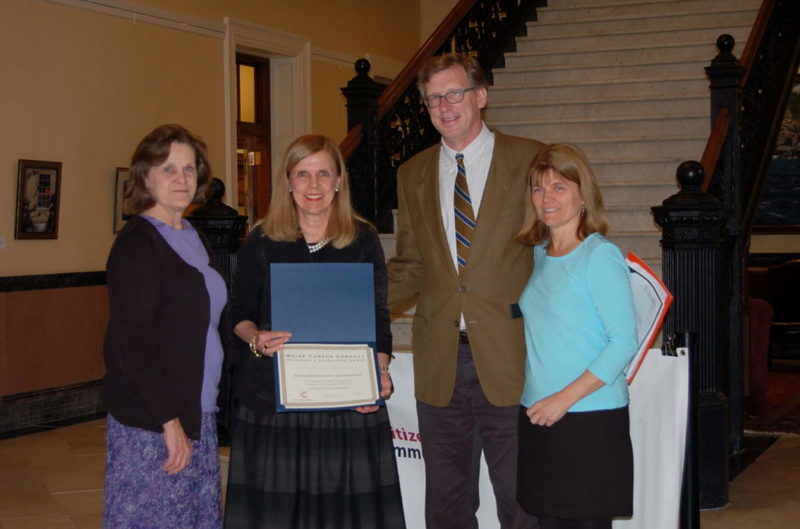 HONORED: The UMF Partnership for Civic Advancement was recently honored by the Maine Campus Compact with the President’s Leadership Award at a ceremony in the State House Hall of Flags in Augusta. The award acknowledges exceptional campus contributions to community service, service learning and civic engagement efforts. From left are Lorraine Pratt, UMF grants writer, and F. Celeste Branham, UMF vice president of student and community services and director of the Partnership for Civic Advancement, received the award from Donald Tuski, president of the Maine College of Art, and Sally Slovenski, executive director of the Maine Campus Compact.